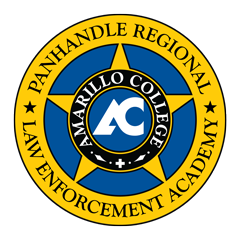 The Panhandle Regional Law Enforcement Academy at Amarillo College has been training people for careers in law enforcement since 1968. The Basic Peace Officer Academy is for those who desire a career in law enforcement. Starting salaries at Panhandle-area law enforcement agencies vary, but base pay generally starts between $30,000 & $40,000 annually. The Daytime Academy starts in September and ends in March. The Evening Academy starts in January and ends in August. 8:00 am to 5:00 p.m. Classes are held on the Amarillo College West Campus in Building C.
Please read the PRLEA Applicant Letter at the top of the page for application steps and disqualifiers for prospective applicants before you apply for the Academy. If you would like to apply for the Academy, you must first meet the TCOLE Requirements. Secondly, you must meet the initial entrance testing or academic requirements or exemptions for the PRLEA. The Entrance Testing and Requirements are listed in the PRLEA Applicant Letter. If you meet all the requirements, please call for an interview at 806-354-6081. *Bacterial Meningitis DSHS Rapid Form; Please complete and turn in to the Academy. *There are several types of documents that we can accept for the Bacterial Meningitis requirement. They include shot records, waiver forms from doctors, and the DSHS Rapid Form, which is the Exemption from Meningococcal Vaccination Requirements for Reasons of Conscience. Financial Aid available for the Panhandle Regional Law Enforcement Academy. The Panhandle Regional Law Enforcement Academy (PRLEA) is a licensed academy and as of December 10, 2018 has been rated “at risk” with the Texas Commission on Law Enforcement (TCOLE). The “at-risk” status is due to a violation of the TCOLE rules that occurred in the summer of 2018. The PRLEA will remain on “at-risk” status until December 10, 2019.